Whether it’s about increasing the productivity of an organization or revising the pay scale of employees in the organization, a performance appraisal is an obvious activity to be performed in an organization. Each organization has its own set of standards on which ground an employee is assessed. Performance appraisal forms help organizations to rate an employee’s performance over a year. These forms help to identify several strengths, weaknesses as well as the scope of further improvement in an employee. Have a look on below listed various Appraisal Forms that can be utilized to evaluate the performance of your staff. Here is a perfect staff Performance Appraisal Forms that is ideal for organizations to assess an employee on the ground of different factors like job knowledge, work quality, behavior etc. This is available in PDF format and is supposed to be filled by superiors. Check out this staff appraisal form sample ideally created to rate staff on the basis of factors like attendance, work quality, general conduct, discipline and more. This form has been designed perfectly for professional use. Are you finding right kind of staff appraisal forms for your care staff? Get this Word file downloaded that consists of a professionally created form sample that lets you rate your employees on the basis of their work quality, conduct, discipline and more. 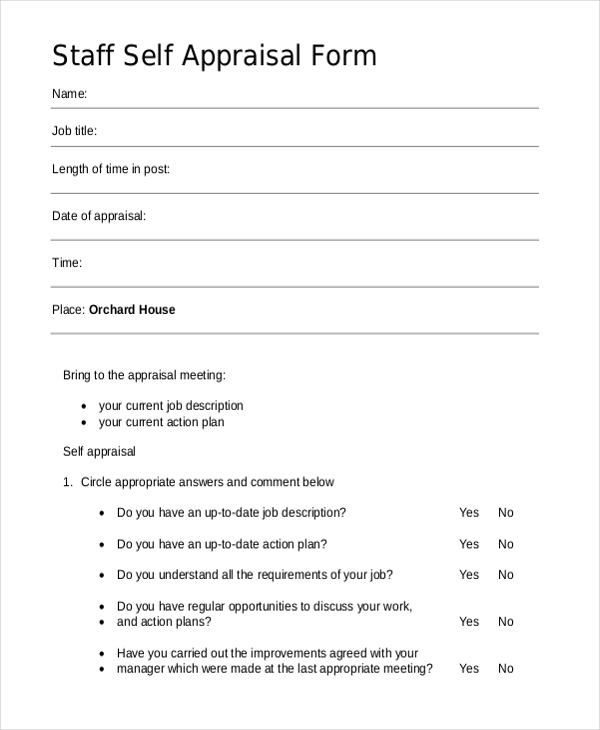 Here is another free staff appraisal form available online that you can download instantly. Created in PDF file, this form can be customized as per your organizational preferences. Download it now. 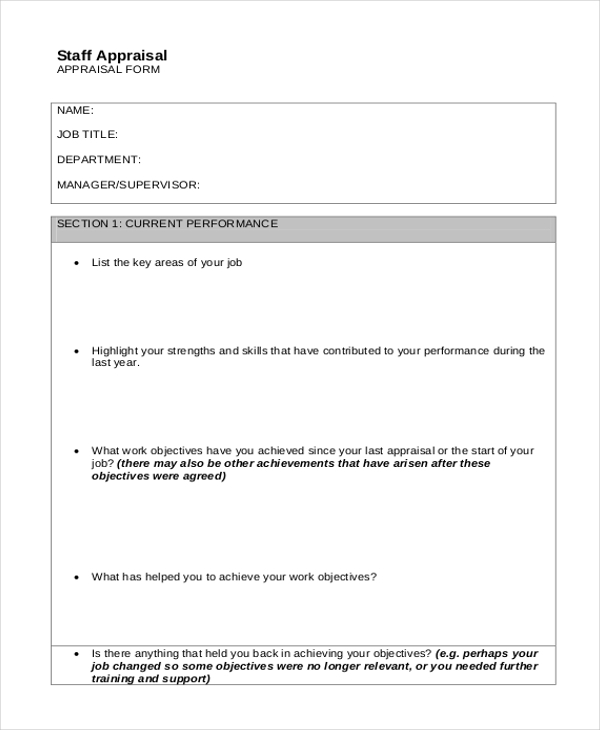 Let your staff be self-assessed with this staff self-appraisal form and identify their opinion about their work, efforts, performance, and expectations from the organization. Get it downloaded now. You can also see Self-Appraisal Examples. Are you looking to evaluate your administrative staff? 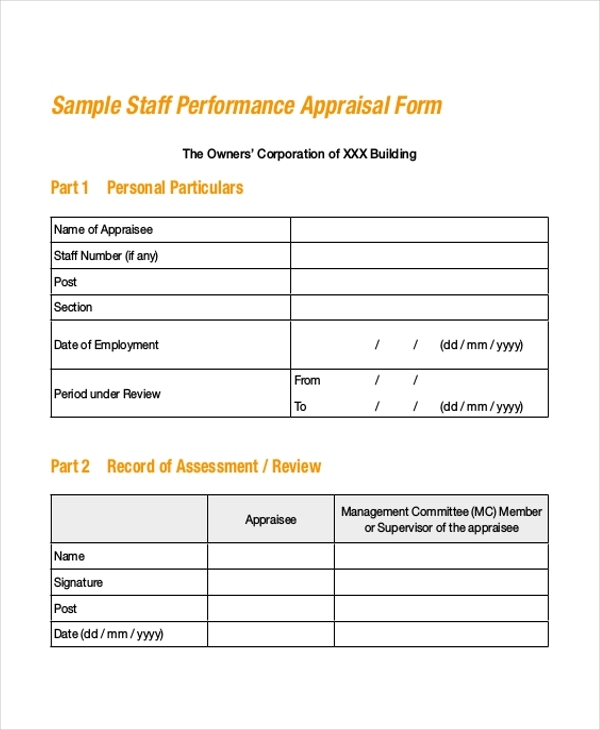 Get this performance appraisal form downloaded online and assess the performance as well as the conduct of your staff effectively. Highly helpful in improving performance as well as productivity of the organization. 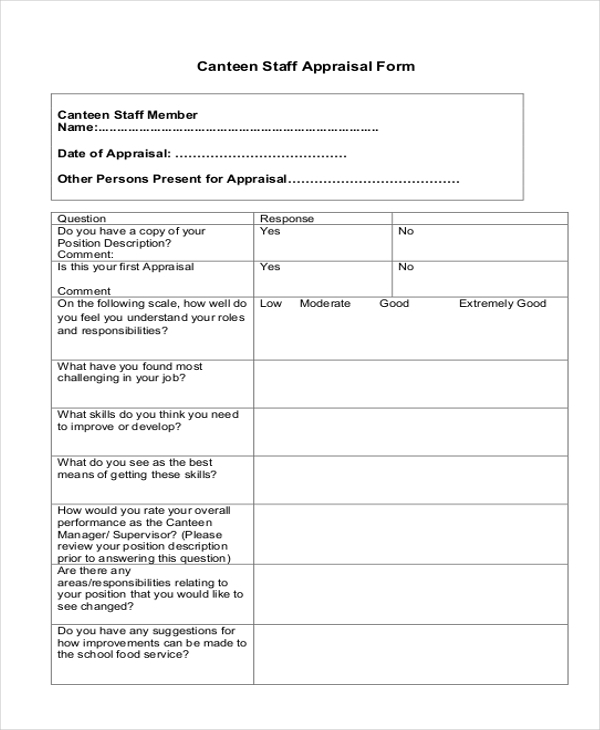 Evaluate whether your canteen staff is performing up to the mark or not with this effective canteen staff appraisal form available online for download in PDF format. You can also get the fields customized as per your evaluation needs. 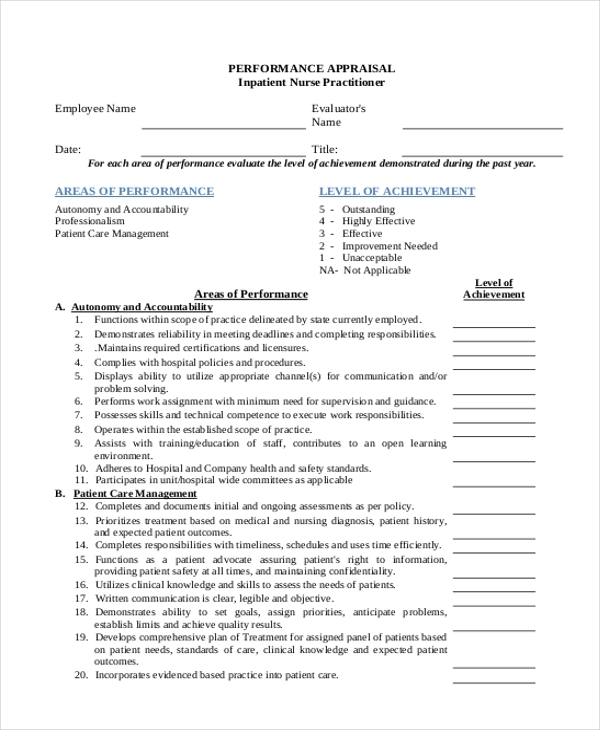 Here is the perfect staff nurse performance appraisal form available online in PDF format for instant download that you can utilize to evaluate your staff nurses on the basis of their performance, behavior, general conduct and more. Why Staff Appraisal Forms are Required? Productivity and growth of any business and organization depend upon the full and honest performance contribution of every single employee. Hence for business owners, it is crucial to evaluate the performance of employees time and again so that various competencies can be overcome. You may also see Teacher Appraisal Forms. For this reason, staff appraisal forms are utilized to rate every employee on a rating ground of 0-5, 0-10 or more. 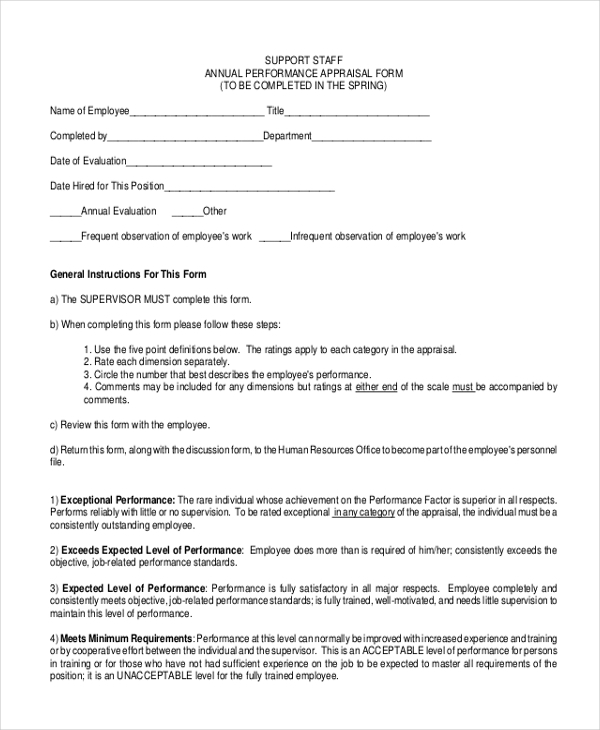 The supervisors and team heads are supposed to rate the employees using these forms. This evaluation of employees is also helpful in deciding their yearly increments. Moreover, organizations may also conduct several development programs for overcoming relevant competencies of employees for better productivity and performance. What are The Benefits of Staff Appraisal Forms? There are countless benefits of performance appraisal forms that make them necessary for every organization. Here are a few of their major advantages. With the help of staff Performance Evaluation Forms, organizations can decide firmly and effectively on yearly salary increments of the employees. With these assessment forms, the competencies and limitations of staff can be identified and thus required measures can be taken to overcome those limitations and increase productivity. As a business owner, you might also be interested in evaluating your employees and increase their overall performance. These staff appraisal forms can definitely help you assess your every single employee and thus take a corrective action for the betterment of performance of the organization. So get any of the above-listed forms downloaded and evaluate your employees effectively.